18 1/16 x 10 1/8 in. Martin Johnson Heade has acquired a reputation both as an artist and a naturalist. His studies of nature, particularly of hummingbirds, began in his youth and continued throughout his life. Following in the footsteps of other American artists, Heade went to South America and the Caribbean between 1863 and 1870. He visited Brazil, Nicaragua, Colombia, Puerto Rico, and Jamaica. At the age of 64, Heade married and moved from New York to St. Augustine, Florida, where he continued to paint for many years. Heade's patron at the time was Henry Flagler (1830 – 1913), railroad magnate and real estate developer of Florida's east coast. When Flagler built the great Hotel Ponce de León in 1885 (now Flagler College), he included studios for artists in order to attract them to St. Augustine. Heade occupied one of these studios. Heade's writings on the conservation of Florida's natural wilderness are unparalleled as pioneering efforts. Heade's contribution to American 19th-century painting is embodied by his study of light, particularly as reflected in paintings of sun-dappled fields and marshes. 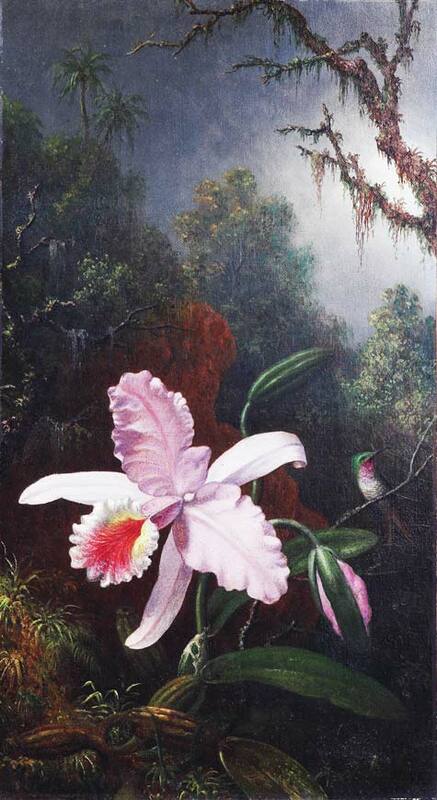 In this painting, the orchid is a carefully studied representation of the “Cattleya labiata Lindley,” which is found in Venezuela, whereas the hummingbird has been identified as an Amethyst hummingbird, commonly found in the Amazon Basin.